It is a great wonder and surprise for all of us that the current Prime Minister of India declared the Clean India campaign from USA. He informed bewildered world audience that 2015 would be marked as the 100th anniversary of Mahatma Gandhi’s return from South Africa for the first time. The Hon. Prime Minister called one and all and took a vow to clean India (physically) in the next 5 years and offer that as tribute to the Father of Nation Mahatma Gandhi. It was a very noble intention indeed. Again the prime minister reiterated the need for cleaning River Ganga which has become a huge and fashionable money making cash cow for domestic and foreign multinational corporations while River Ganga gets dirtier and dirtier year after year. Ganga cleaning since the inception consumed thousands of crores with no visible results and now additional thousands of crores are earmarked for the same mission. One surprising fact is that no one talks about Yamuna being dead along with other 600 rivers in India and thousands of other water bodies which altered the agricultural productivity or food safety of India permanently. It was very surprising that in our enthusiasm in the campaign of Clean India, we never actually changed our attitudes; whereas on the other hand Mahatma Gandhi from day one took the broom and went straight to clean the toilets for the conference he came to attend from South Africa. In the name of progress and modern development we have created an unprecedented crisis in terms of physical cleanliness in India. The mental, spiritual and religious cleanliness gone beyond correction and recognition long time back with the dedicated efforts and onslaught on our values system since the dawn of European rule in India. At least now the urgency is felt to clean the physical filth that is visible all over the country now. Though no doubt India awaits a spiritual reformation in full swing, it equally awaits a physical transformation as a society and a country to even claim that we represent a great culture. If we look in hind sight in terms of what we did in the name of development in the last 60 years since independence, it will be glaringly clear that we created the dirtiest nation on earth; a terrific price we paid for the modest development that we achieved on par with world nations. If we were really developed today we would not beg world nations to come and help India to create jobs, to develop infrastructure, to make India a world manufacturing hub and at a very basic level to help clean India physically. 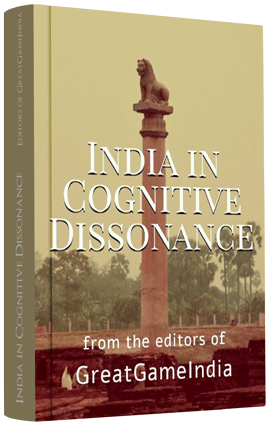 In this current series we start examining the Clean India campaign with the need of physical cleaning of India starting from physical filth to its spiritual filth exploring indigenous solutions rather than inviting Multinational Corporations or their erstwhile incarnations that we got rid of as East India Companies; that created the problems at the outset of their interaction with India. What and where did the things go wrong? And what is the solution? Many Indians are too often criticized as very superstitious in terms of following strict traditional life of excessive cleaning of themselves even to cook daily food in terms of their Acharas or Vyavaharas even today. But from the beginning of independence, an irreversible trend started. In the name of development we resorted to exceptional industrialization which was necessary for a new born nation. But what got created were unprecedented industrial pollutants which were left into the air and rivers without treatment. Second, in the name of agricultural development we started resorting to usage of chemical and industrial fertilizers which finally ended up in our water streams, water bodies and rivers polluting the pristine rivers that are sources of life saving water, commerce and back-bone of transportation of ancient India. Third, an unparalleled rush to build huge dams in the name of modern temples was unleashed on India, when at that time and even today every western nation is de-damming to allow uninterrupted flow of their rivers. This created large stretches of river beds exposed without water thus paving way for these river beds to become the grounds for dumping every waste that is generated in the name of modernization. It was then told to us that urbanization was the best way for development and concentration of populations in large numbers in one urban conglomerate will help us improve life standards. This created a very severe strain on sanitation, clean drinking water and other services, as these services cannot pace up with the swelling populations in urban centers. What resulted was the exposing of urban populations to filth and unhygienic conditions thus creating many modern diseases affecting national health resources tremendously. This thus paved way for the medical multinational corporations to have a field day in selling their drugs to push Indian population towards drug dependency rather than healthy life styles. Urbanization created another problem. As village population started thronging to urban centers, a shift in terms of rural labor availability got created. These shortages started affecting the agricultural sector thus gradually re-orienting the Indian economy from rural to urban economic model. The fall of agriculture due to fall in productivity of soil and labor shortages gradually forced farmers to shift focus away from agriculture to other revenue sources; the direct result of which was farmers selling their cattle populations for slaughter. With this, food shortages started appearing, thus paving way for net imports of food items which was never heard of in Indian history. Urbanization created a bonanza for many construction and real estate companies, but the construction process moved in such unconcerned way that no care was taken to abide by any codes of decent living. Thus concrete jungles started popping up and entire wastes -construction wastes and the resulting human settlement wastes – started ending up in rivers and other water bodies located nearby. Moreover the very nature of manufacturing of cement started creating its own pollution at times covering entire cities with smog causing massive health problems. With this, cattle and cow centered traditional medical systems started disappearing for development oriented modern medicine; the physical cows themselves started disappearing slowly but steadily. Doom started setting in India for a total collapse of hygiene in India so that health of India can be taken care of by medical MNCS in the name of liberalization and urbanization. Here came another problem of medical wastes which we again generously in almost uncontrolled manner discharged into our water bodies or landfills around, causing a crisis kind of situation in hygiene issues of India. Even during the last decade an urgent rush was observed to build hundreds of dams on remaining rivers in India to supply water for ballooning urban centers again causing a further danger to health and hygiene of many population segments. This damming will disrupt the dispersion of surface moisture distribution on earth and result in disruption of already scarce monsoon rains thus paving way for another round of water scarcity and abandoning agriculture. This perpetuates the same vicious cycle of more dams-more development-more debt-more dependency and more physical ill health. With the dams the precious mineral and metal resources that get deposited near sea-beds in sand like thorium etc. start to vanish. Indian available thorium deposits can also provide a very cheap clean energy source for coming centuries and this resource will steadily vanish from the coast line of India if all rivers are dammed. But all the above development came with a price. The price is the dependency on source of energy as an economic engine. For a long time it was cow dung and cows were central to the energy/transportation/economic model of oriental countries. But since independence it was replaced by oil (petrol and diesel) as central to economic engine. In the agrarian sector for long the energy requirements were based on the concept of one man’s waste is another man’s resource and this belief set a trend of massive natural community recycling, each doing his role but collectively aiding to fulfill one of the greatest fundamental environmental principles that we should not destroy our surroundings as it destroys our health and hygiene. With the replacement of oil as central economic engine we created another round of massive pollutants which were then released into already scarce water bodies without any supervision. With the rivers vanishing, agricultural lands vanishing and associated cattle population dwindling, the space thus created by these receding systems was filled with filth, causing irreversible damage to environment and public health. The first jolt both on international and Indian scenario was the oil crisis of 1970s. 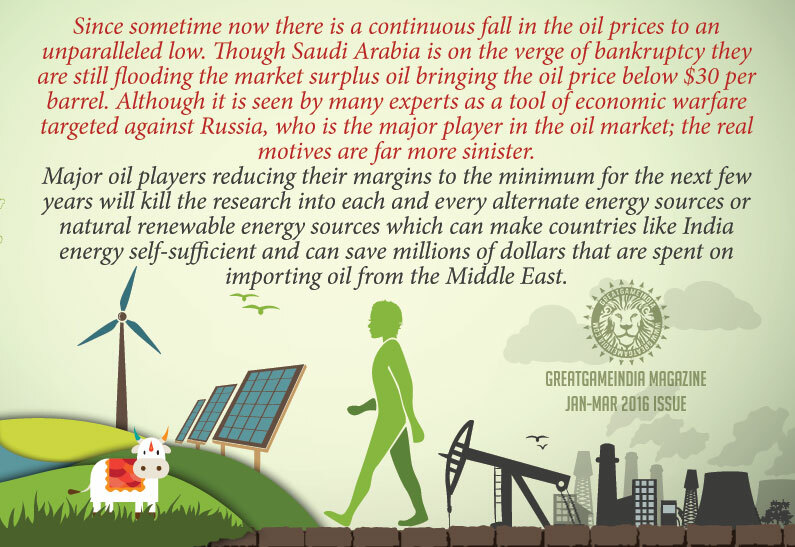 Internationally it was the oil crisis of 1970s where suddenly many nations found themselves in the grip of Middle Eastern Arabs and realized the risk of energy security to the vagaries of the Arab policy makers. On the domestic front we woke up to a rude shock when the multinational oil companies refused to supply oil for Indian armed forces who were fighting for defending our borders with our western cousins in 1971. This move by oil companies prompted nationalization of the entire oil industry in India and stimulated a search for self-sufficiency in energy sectors. However, unfortunately this pursuit of energy self-sufficiency pushed all other sane norms of environment or public health to sidelines starting a beginning of callous political policy making where balanced structured development took a back seat. As science started catching up with industry politics and geo-politics of international finance, it was finally realized that the ultimate purpose of science and technology was to serve the society from where it emerged. Science and technology should help the sustainable development, economic prosperity and cultural integrity of the societies that they serve. In this regard a comprehensive attempt was made to take a look at the current crisis of health and hygiene and the filth that was raking up havoc in India and the world at large. The way mankind was using energy, oil or electricity generation again by using oil became an integral part of such studies to figure out solutions as to how to get out of this unprecedented problem of filth, dirt and hygiene. In the process it was also realized that nature does not produce any waste and that it is the human consumption that produce waste. There are many methods of management to handle waste which has caused much damage to environment, public and personal hygiene, rivers, water and air and created too many modern day diseases. The very definition of generation of waste has undergone a change since 1971. A lot of scientific and technological progress has been made in turning waste into energy, thus preventing carbon dioxide emission and stopping human and industrial effluents from entering into rivers, which is the beginning point of clean cities or countries. 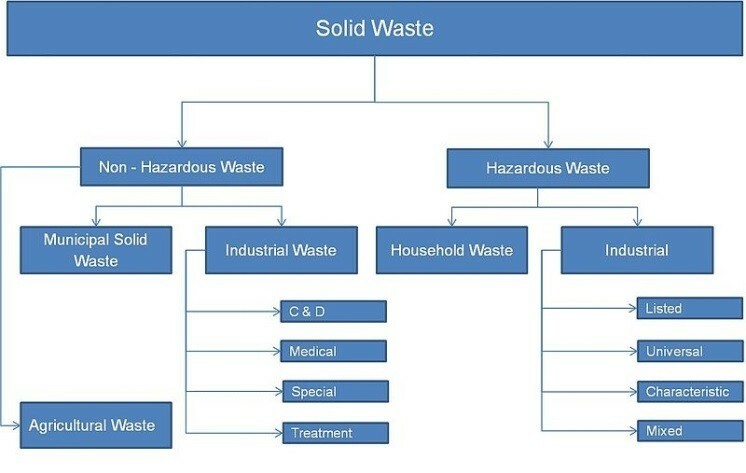 The following diagram describes the attitude change in creating or treating waste. 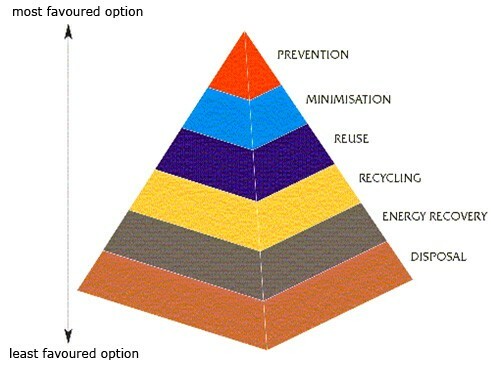 With the broader attitude changes since 1971 the concept of waste was re-categorized from the perspective of energy generation with an aim at 0 percent disposal. The technologies progressed from Generation I to Generation IV from 1971 to 2012. With the oil prices shooting from $20 a barrel to $100 a barrel, those technologies once looked expensive started becoming cheaper options. One such solution discovered was using cow dung or cattle dung to generate energy in the form bio gas and using it as cooking gas, electricity and substitute for auto fuel or petrol and diesel. Many other sources of energy were explored like wind energy, solar energy, wave energy etc. We confine here only to the cattle based energy alternate solution as Indians still, even in the so called modern times worship our holy cattle, especially the Holy Cow. Many European nations are switching towards clear road map of waste based energy generation methods especially using cattle and human wastes. In India we still are using the Generation II Gobar Gas technologies to derive energy from cattle based excretions despite our national burden on oil increasing year by year exponentially and contributing for many price hikes. As usual with the case of any technology in India this Gobar Gas technology was also started with much pomp and 2 million units were set up. Lots of government money flowed into the sector in the name of subsidy. Many loans were given to farmers. Most of the units, at least 75% of the units failed in the first two years. There are complaints that multiple loans were taken against a single unit and money was swindled away into the pockets of corrupt politicians, officials and greedy citizens. Huge sums were written down as irrecoverable loans and business was as usual in India with people focusing on the oil as a substitute and working for the international oil oligarchs yet complaining about the health and hygiene deterioration in India. While India stopped thinking about Gobar Gas as energy alternative, the West moved forward to discover how best cow dung could be utilized. US and Europe under leadership of Germany took the threat of energy dependency on Arab oil very seriously and started to explore every alternate mode of energy self-sufficiency. The bio gas of 1971 underwent a metamorphosis as Methane Bio Gas (MBG) in 1990 and by 2008 took the name of Commercial Bio Gas (CBG). With the rapid advancements in bio-technology in US and Germany who looked oil crisis as a national security concern the evolution of Bio Gas reached the stage of alternate solution for oil or natural gas in the name of CBG.